A newly renovated hotel with cycladic architecture and friendly and family atmosphere. The Yiannaki Hotel is located in the settlement of Ornos, in a beautiful bay area, on the western side of Mykonos (Myconos) Island. The hotel is situated just 200 meters from the beach and offers a spectacular view of the Aegean Sea. The Yiannaki Hotel in Ornos, Mykonos is built according to the traditional Cycladic architectural style and is comprised of 45 tastefully-furnished rooms. The management and the personnel of the hotel offer guests an array of facilities and services, catering to their comfortable and enjoyable stay. It is an A’ class (****) hotel and operates from April 20 to October 20. Our hotel has been completely renovated to offer our guests the finest accommodation. Please visit our site in a few days to see photographic material of our newly refurbished hotel. 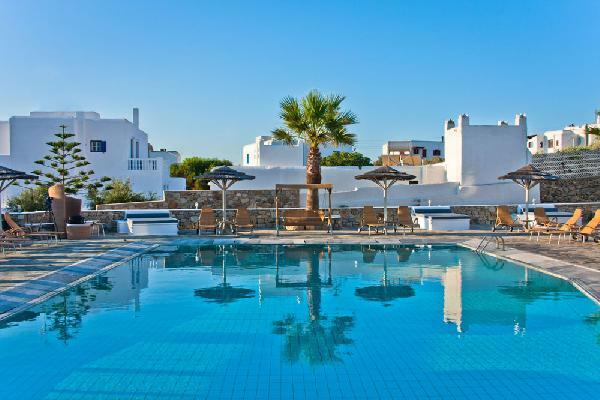 The Yiannaki Hotel in Ornos, Mykonos is comprised of 45 spacious, fully equipped and furnished rooms that provide guests with every comfort and facility, guaranteeing a thoroughly relaxing stay. Είστε ιδιοκτήτης ή διευθυντής στο YIANNAKI; Εγγραφείτε τώρα για δωρεάν εργαλεία, που μπορείτε να χρησιμοποιήσετε για να βελτιώσετε την καταχώρησή σας και να συνδέσετε την ιστοσελίδα σας και το σύστημα κρατήσεών σας. From 15/9 till 20/10 a child aged 0-8 years old stays free with the parents.